Our research helped the University of Georgia define a market position that more accurately reflected its accessibility and selectivity. The University of Georgia (UGA) was, at the time of our initial engagement, emerging as one of the nation’s elite public universities. It had made significant strides in academic quality, study abroad and honor’s programs, but was struggling in its ability to attract a more diverse—both in terms of ethnicity and geography—student body. The University sought to enroll high-achieving students who reflected the diversity of the state. It also sought to enroll more students from around the country. Long held perceptions about the campus being inhospitable toward minorities and students from rural areas hampered progress toward these goals. Through Circles of Influence, we heard students, faculty and staff share wonderful examples of service, research, internship and study-abroad opportunities. But we also heard them share painful accounts about how the University had fallen short in terms of welcoming and supporting diverse members of the community, particularly African Americans. A Communications Audit revealed opportunities for UGA to engage earlier, more honestly and more effectively with prospective students. What do others say you are? Focus groups with prospective students and their parents in Atlanta, Jacksonville and Dallas revealed enthusiasm about UGA and anxiety about college search. Out-of-state students, in particular, were drawn to the University. Prior to our engagement, the University had already invested in several external marketing studies, which we also carefully reviewed and which informed our work moving forward. Based on this discovery, we created a versatile and optimistic admission campaign that acknowledged the institution’s past while keeping an eye toward the future. The tagline “From Here On Out” was used to convey the sense of possibility inherent in international study while also communicating the University’s renewed commitment to fostering a diverse learning community. 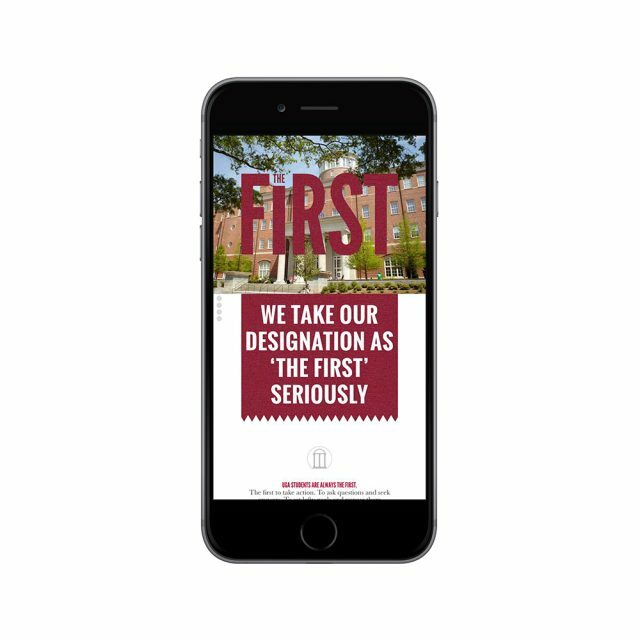 Visually, the campaign was equally versatile, utilizing images and design motifs that simultaneously suggested tradition and progress, prestige and inclusiveness. Further, rather than creating a multicultural brochure targeted only to African Americans, the admissions team created a mailing for every prospective student: a piece that opened by truthfully detailing how UGA was late to the game in welcoming African-American students into its gates. The piece went on to detail, however, the ways in which the institution has changed—and improved—since that time, describing how the University has been enriched by encouraging diversity in all its many forms. And across the center of the piece, in a bold, banner headline, ran the unequivocal message, “Our community is stronger with the voices of many.” This important language was soon adopted campus-wide, appearing on computer screensavers, giveaway tote bags and orientation t-shirts. And ultimately, this commitment to coherence—to telling the truth—influenced real change at UGA. The results were impressive: In the first year of the campaign, applications from multicultural student audiences increased by 44% (including 38% for African-American prospective students specifically) with a yield of nearly 100% growth in enrolled non-white students. Nancy McDuff, who was the Associate Vice President for Admissions and Enrollment Management at that time, said, “We met a number of important goals, and our campaign helped us do that. We succeeded in meeting target enrollments in numbers, quality and diversity. In 2012, we were invited back to UGA to work on another enrollment campaign given the significant progress and tremendous change that occurred since our initial work began in 2004. 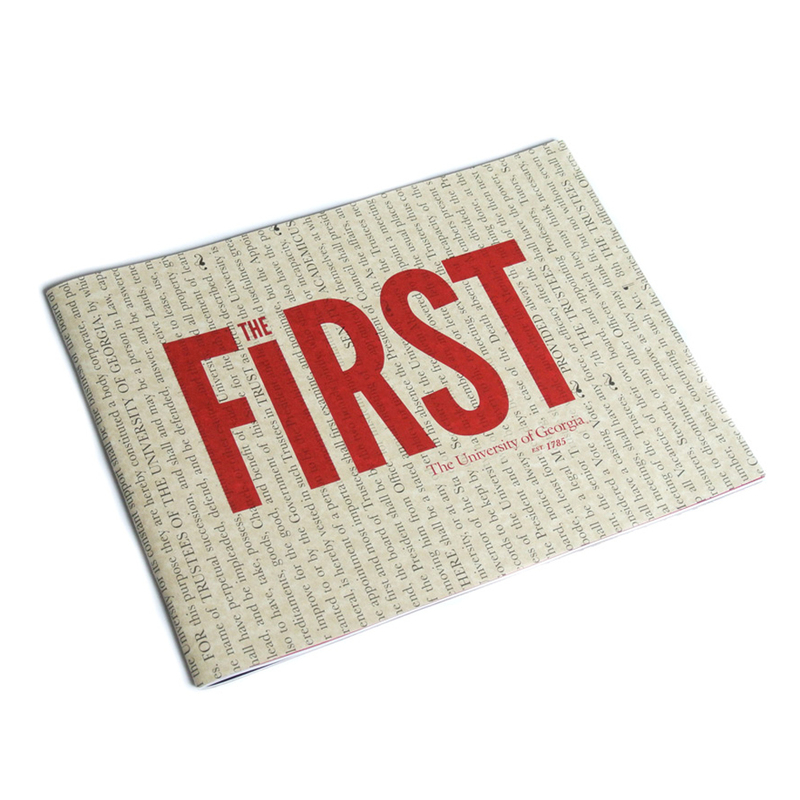 We based the new work on UGA’s position as the first publicly chartered university in the United States and created numerous pieces that celebrated what it means to be “The First,” including a beautifully designed viewbook and a landing page where prospective students could take “The First” pledge, which allowed them to announce, via social media, what they would be the first to do. The results were again impressive: In 2013, UGA admitted the strongest class—by all measures—in the institution’s history, and continues to enroll record-breaking classes today. Photography by Tom Galliher. Art direction by RHB.